(Nanowerk News) A sensitive new Stanford-developed disposable chip detects low concentrations of the explosive trinitrotoluene (TNT) and a close chemical cousin of the dreaded toxic nerve agent sarin in water samples. The research appears online this week in the journal ACS Nano ("Sorted and Aligned Single-Walled Carbon Nanotube Networks for Transistor-Based Aqueous Chemical Sensors"). Traces of TNT can leach into streams near munitions-making and testing sites, and then be detected downstream. Terrorists could try to mix sarin into a reservoir or water mains. An electronic sensor that can instantly detect very low concentrations in water would be a desirable technology for staying ahead of potential attacks, said chemical engineering Associate Professor Zhenan Bao, who leads the group that developed the chip. A diagram of a nanotube transistor on a flexible chip for detecting toxins or explosives in a water sample. Although many researchers around the world have devised a wide variety of chemical sensors, Bao said, the Stanford chip offers a rare combination of low-cost materials, low power usage, robust and repeatable performance in water, instant response and physical flexibility. To date, lower detection limits have only been achieved with complex, expensive, non-portable optical systems. "We have used semiconducting carbon nanotube network transistors to make extremely sensitive sensors that are capable of operating stably under water," Bao said. "We showed sensitivity in the range of a few parts per billion for detection of explosive compounds such as TNT." A nanotube is a rolled-up sheet of carbon atoms that is only one atom thick. Every atom is therefore on the tube's surface. This makes single-walled nanotubes very sensitive to nearby molecules that would drift by in a water sample, says postdoctoral researcher and article co-author Melburne LeMieux. The Stanford sensors are more sensitive than other waterborne, nanotube-based sensors because they are built using processes developed in Bao's lab that ensure a high-density of well-aligned nanotubes that are almost purely semiconducting. Errantly placed or jumbled nanotubes would reduce the sensor's sensitivity. Semiconducting nanotubes – those that switch electrical current on and off rather than always conducting it like a wire – can detect a wider range of molecular interactions with greater sensitivity than purely conducting nanotubes. The chip itself is made of an inexpensive, flexible plastic substrate, rather than the more expensive, rigid silicon that underlies most computer chips. The researchers also use a thin polymer gate electrical insulator layer, which allows the device to operate on less than 1 volt of electricity. "By combining our nanotube self-sorting deposition process with our ultrathin cross-linked polymer dielectric [insulator] formulation, we've enabled underwater, nanotube-based chemical sensors," said paper first author Mark Roberts, a former graduate student who is now a postdoctoral researcher at Sandia National Laboratories. In lab tests, LeMieux and Roberts found that when the chip was exposed to water with just 2 parts per billion of either TNT or dimethyl methylphosphonate (a sarin cousin), the chips instantly reported unmistakable changes in electrical current. "It's very rewarding when you add in the chemical and you see this very rapid response," LeMieux says. "I don't know if it's must-see TV, but it's definitely worth watching." To make real contributions to security, the authors acknowledge, the chips will have to be packaged into a field-worthy device with a power supply and a wireless transmitter. 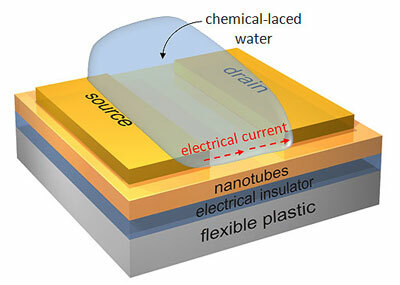 They also will require more sophisticated nanotube circuitry, or microfluidics that can precisely sort through all the chemicals that would likely be present in a real-world water supply. Those are both next steps for the group. Support for the research came from fellowships from NASA, the Sloan Research Foundation and the Intelligence Community Postdoctoral Fellowship Program, as well as from the National Science Foundation.